Looking back through some of my previous posts, particularly those from the last week in April, really highlights what terrible weather we are having at the moment. Temperatures are steadfastly refusing to get anywhere near double figures and don't get me started on the last time we had clear skies. This evening however a break in the cloud developed promising the potential for some sort of decent sunset. 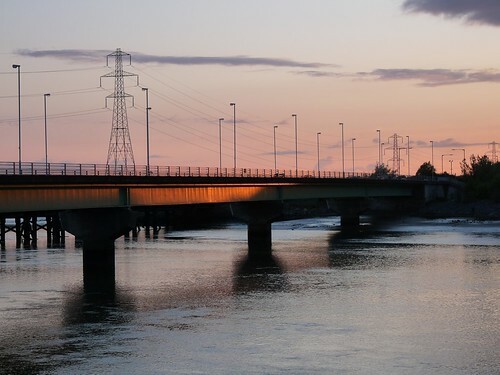 I couldn't go far due to being on-call from work so decided to go to Loughor bridge. Surprisingly this was the first time that I has ever actually stopped at the bridge as usually it is just something that I drive over on the way to Gower or Llanelli. The tide was well in and the sun did manage to put on a show, lighting up the bridge and the clouds very nicely. 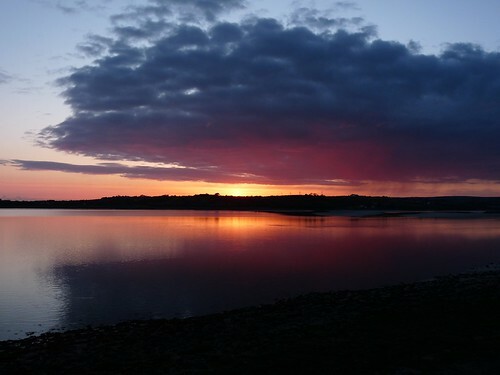 Even better than the sunset though was the path and park that I found along the banks of the river Loughor here. Despite living within sight of the estuary for the last six months I never knew of their existence. We spent a very enjoyable half hour walking whilst the sun finished its descent. A single Whimbrel was feeding in the freshly exposed mud with a Ringed Plover nearby for company. Other waders included a couple of Oystercatchers, four Little Egrets and a Grey Heron. The Gulls were represented by seven Lesser Black Backs, a single Great Black Backed and several Black Headed. There also appears to be a fairly massive Rookery in the vicinity with forty or so noisily taking to the air at one point. This is definitely a location that I will be visiting more regularly, particularly when the tide is lower as it looks like a very promising location for catching up with a few more wader species.